All good things must come to an end. We arrive at the Delhi airport extremely early for our 10:35 PM flight. This airport is huge and also the most secure I’ve ever been in. They had guards at each door. To get in, you had to provide your ticket and passport and it could only be a certain number of hours before your flight. We got in before the ticket counter even opened. My friend had been able to check-in and par for the course; I had an “error” and couldn’t check in. Wonderful. Checking in was interesting. It ended up taking four or five agents to figure out the issue so I could get my boarding passes. Luckily my luggage was checked all the way home. Winning. Security was super secure. Ironic I know. We got through, only to learn we were supposed to have these tags on our hand luggage so they could stamp them. There are no signs telling you that, and there also aren’t bins of these tags just around. To make the experience even more special, my backpack was completely unpacked and everything was run through the scanner alone. It was pretty cool. Or whatever the opposite of cool is, yeah it was that. My main goals were food, shopping and shower. Mind you at this point we had been up since 7AM, slathered in Deet and sunscreen, plus a layer of sweat and dirt. The last thing I wanted was to sit in my own filth for another 25+ hours going home. Side note: the shopping in the Delhi airport is fantastic! We could have spent hours in those shops! After our dinner and shopping it was shower time. We didn’t have any kind of lounge pass, but we ended up buying a pass to the Air India lounge. We got three or four hours of access, internet, food, drinks, and nice chairs. For some additional ruperts we got access to showers. All in all it cost about $20 –ish dollars each, Yeah cheap. I’m not sure what I expected from an airport lounge shower, but I have to say it was one of the nicest showers I have ever been in. We each got our own room with a sink, toilet and shower. They provided anything you could need, which I also didn’t expect. The shower was so great that I washed everything twice. Seriously amazing. 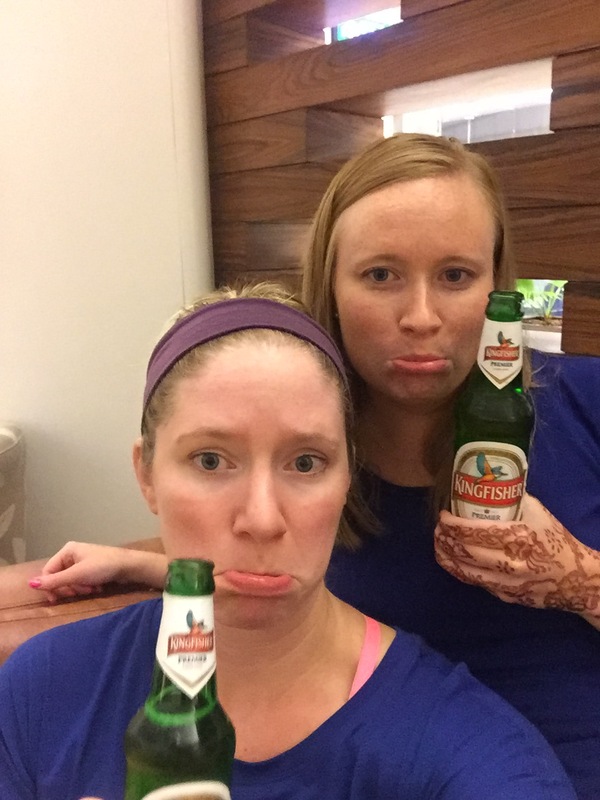 Showered, fed, and happy-ish we had one final Kingfisher in the lounge and said our final farewell to India. It was sad, that is, until this happened. On our way to the gate, I got two bottles of water from the bookstore. I am all about staying hydrated when I fly and this was going to be 14+ hours in a steal tube up in the air. I needed water to survive. So I was a happy camper. Upon arrival to our gate, we realized there was another security checkpoint. Wait, I already went through all this. In my naive brain, I thought okay no problem, security again but since I got my water IN THE AIRPORT it will be fine. Wrong, I was so wrong. I had to throw BOTH of my brand new, un-opened half liter bottles of water away. To say I was livid would not be saying enough. I’m still pissed about that now almost a year later. I appreciate security yes, but at least warn us. Say that we can’t buy them. Or make us put them in a sealed bag or something. It was ridiculous not to be able to board a 14+hour flight with water. Absolutely ridiculous. Okay, rant end. This was going to be the longest flight I had been on. My previous record was flying from Fiji to LA in 2007. Luckily I was exhausted and ready for sleep. As the amount of people getting on the plane slowed, I realized I had been given the greatest gift one could ever hope for sitting in coach on a 14+ hour flight. An entire row to myself. Me, just me! Ahhhhhh (angels singing). As a taller person, this was one hell of a win. It would also mean the flight wasn’t full, so there were not as many people up and down and it was just a quieter flight because of that. All good things. Our plane coming home was an infamous 777. I hadn’t flown on one in years. And this quite possibly could have been one of the oldest planes I’ve been on in a long time. It was totally fine until my headrest actually broke. Eh, I guess I did have three seats so it was alright. But still, it broke! What the what?! The other odd thing was that our flight map didn’t work the entire journey. So we had no idea where we were as we were flying in pitch-black skies all night. Creepy. Overall I expected it to feel like I was flying FOREVER and be so ready to get out of a plane. It turns out I did not feel that way at all. The flight was super easy. So easy that it makes you think about how “close” other destinations are. We landed in lovely Newark around 4:35 AM and got through customs with no issues to drop our bags and make it through security for our final flights home. Sadly we said goodbye as I headed toward my gate. Luckily I had pre-check because even at 5:45AM on a Monday, Newark was bumping. Picture this, I’m in the pre-check line in my yoga pants (huge shutout to my first pair of Lululemons. I would totally make that decision again and again. They felt like wearing nothing even after 14 hours), hair in a bun, zero makeup on, henna everywhere and all of the other travelers were completely suited up. I fit right in. Not! On my last flight I was asleep before they finished the safety demonstration. When I woke up, I wasn’t even sure we were in the air. We were. That flight was easy and getting through the airport to an Uber home was no big deal. The return journey was so easy that it restored my faith in flying. And confirmed my addiction. I was home again. Though my soul felt like it was still a world away. I wondered when it would return? Until then, food, shower and laundry.